Some of my favorite about.me pages are those of illustrators. They allow their backgrounds to say so much about what they do. Above, Bas Waijers uses his own illustration as his background, but still includes his own image as an avatar. His illustrations include fanciful characters and are lovely to peruse. 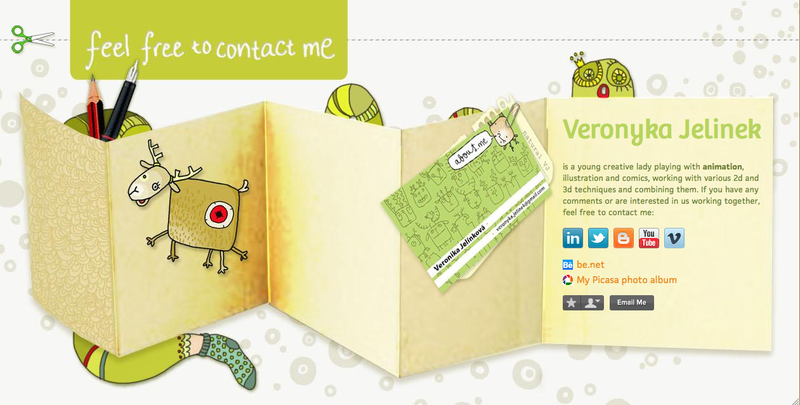 Veronyka Jelinek takes a somewhat more literal approach to her online business card at her page. But, she includes the 2d and 3d techniques described in her biography. Finally, Pascal Quimper illustrates what is assumed to be a self-portrait. Each approach is unique to each artist. What is your favorite illustrated about.me page? Let us know in the comments. The work by Veronika is great but I have to scrool ; so I choice Bas W ! Agreed Paola – your page is lovely! Thanks Laura! I’m so happy and excited for your reply. I found my page in your Inspirational Directory! Wow!